Nature's role in artistic inspiration has always been profound. From Claude Monet to Frank Lloyd Wright, the notion of capturing our organic surroundings have lead artists and designers to the height of their careers. Australian artist, Helen Andronis Ibrahim, is putting her own spiritual and modern spin on earthly enlightenment. Growing up in Melbourne, Australia, Helen Andronis Ibrahim (who also goes by her Greek pseudonym, Eleni) learned early the importance of family, freedom and amiability. Eleni's inherent spirit lead her to develop a distinct and appreciative relationship with nature, one that would be a major foundation in her career. Fast forward into adulthood, Eleni established herself as a successful hairdresser who dabbled in art and channelled her creativity recreationally. 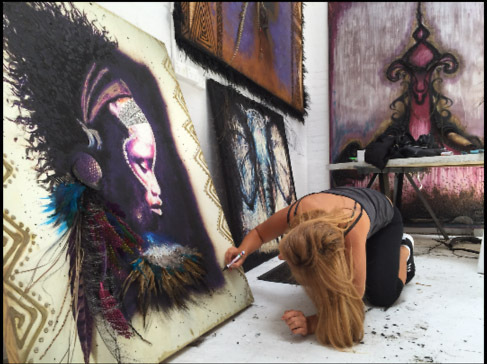 In 2009, a few years into her career, Eleni left her steady position as a hairdresser in order to pursue art. An astrologer by the name of Teymara and now a close friend, prompted this leap of faith. 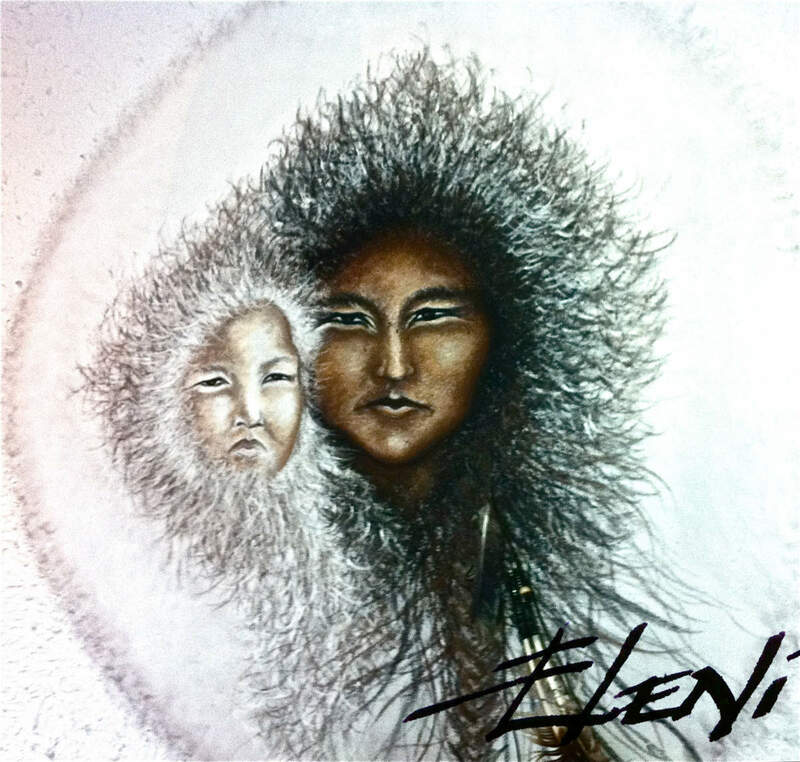 Aware of Eleni's spirited nature, she encouraged her to pursue passion for art. Although Aboriginal tribes have always intrigued Eleni, it wasn't until this meeting that she actively pursued a close relationship to the elder- one that she would easily deem transcendent. Kunmanara Randall is known throughout Australia for a few unique reasons, all which either stem from or express his altruistic disposition. He was a member of the Stolen Generation, those who were children of Australian Aboriginal and Torres Strait Islander descent. These children were removed from their families by church missions and Australian Federal and State Government agencies for reasons which still remain skeptical. Resulting from his experience, Kunmanara Randall had become the cogent voice of reason, honesty and love amongst his people. As Kunmanara Randall and Eleni's friendship progressed, so did the creative inspiration encouraged by Kunmanara Randall's intrinsic connection to nature and virtue. His influence didn't stop at neighborly love. His affect spread amongst nations by enhancing rights and community development while actively working to create an understanding between all sects and civilizations, both Aboriginal and non-Aboriginal people. 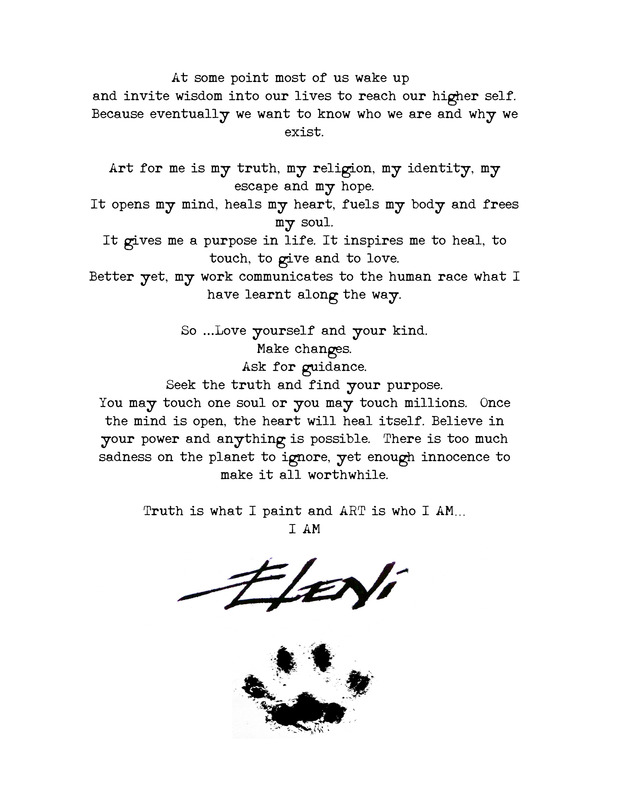 Undoubtedly, Eleni found herself devoted and impassioned by his message. It is clear how Eleni's work heavily reflects his morals, especially in the sense of a literal and metaphorical association. 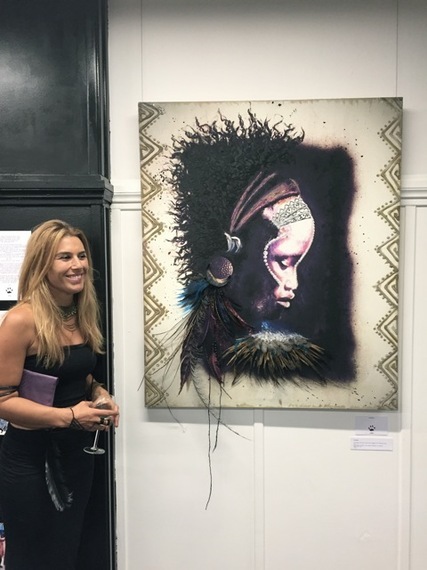 Yet underlying in every piece is an indication of specific points throughout her personal journey and the growth of her soul from travels amongst varying tribes. Each massive canvas is crusted in fallen earth and acrylic paint. Bark, twigs, remnants of hay and hair make up the headdress of a Native American, the beard of Kunmanara Randall, and the unkempt grass of a focused wolf. The use of acrylic paint, while necessary in highlighting distinct features, merely aids in creating a bridge between art and nature, which Eleni seems to accomplish effortlessly. 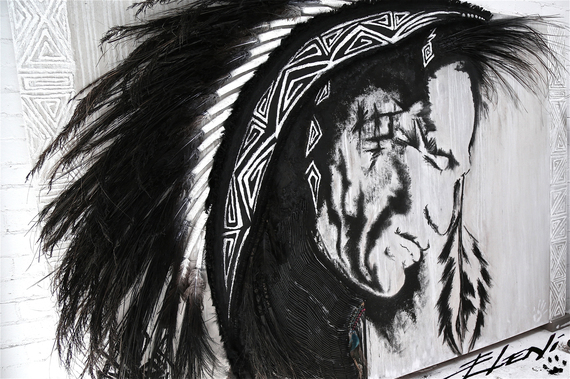 There is new meaning given to "earth-inspired" art and a unique voice radiates every time a member of the tribe is embodied. It is Eleni's inspired method of turning land into art that evokes the feelings of interconnectedness between persons, cultures and creatures of this world. "To find my material, I usually run to my favorite spots. Usually, I know where to look...but the land speaks to me. It lets me know what exactly I can use it for," Eleni explains. "It is very similar to a language that I understand, one I have been learning my entire life. But in saying that, Mother Nature can certainly make me work for it." Like Eleni herself, the paintings have travelled around the globe, making stops and impressions along the way. I AM, the immense and powerful portrait of Kunmanara Randall, made its way to Times Square under New York's See Me Gallery in 2013. 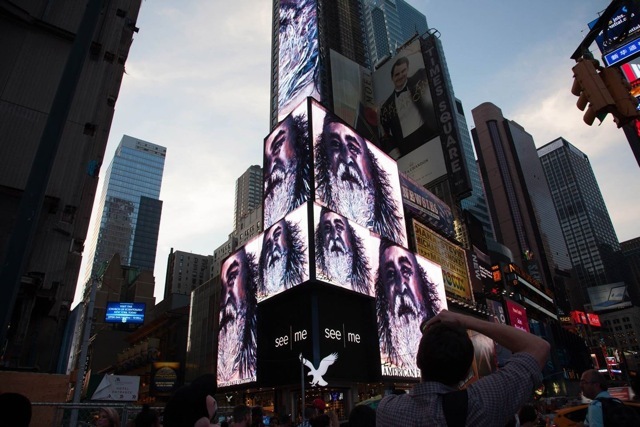 The painting was digitally displayed on a 25 story building in the middle of the city, along with an early sketch of her piece TRUST. TRUST which was completed earlier this year, depicts a stoic Native American man heavily inspired by one of Eleni's treks, specifically to the Hopi tribes of Arizona. I AM was also a semi-finalist in the Doug Moran National Portrait Prize 2012 as well as an entrant in the Archibald. 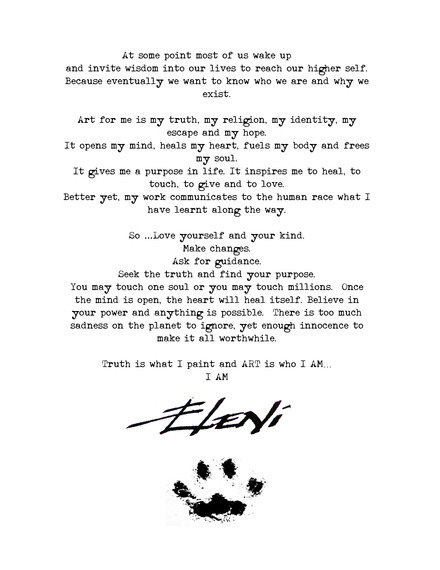 On December 3rd, Eleni along with her husband Michael, launched their gallery-cafe hybrid in St. Kilda, Melbourne, which serves as a public exhibition titled "I AM ELENI", as well as a gathering space for individuals seeking some soul. In May, 2015, Kunmanara Randall passed away. 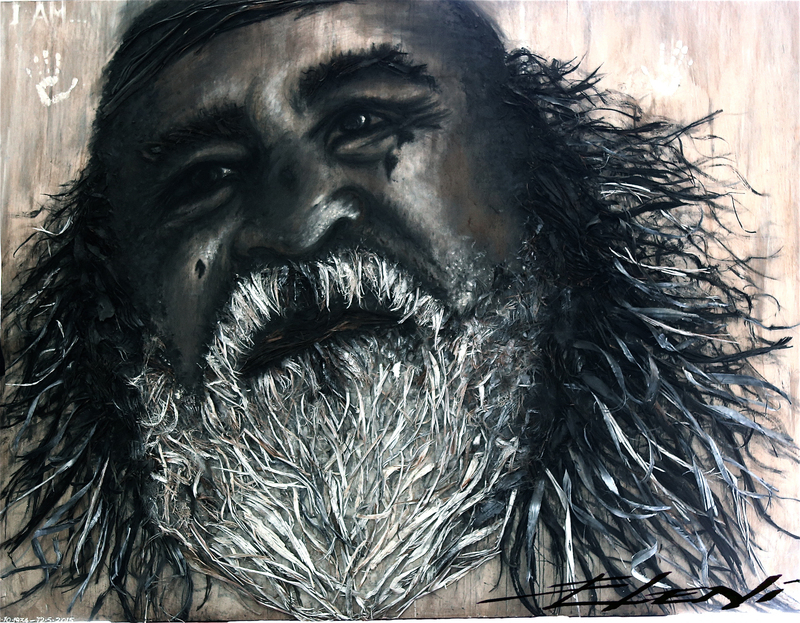 His legacy, spirit and message are continuously spread by Eleni's work, Indigenous Tribes and everyone he so greatly affected. To keep up with Helen Andronis Ibrahim, visit her website www.eleni.cc.